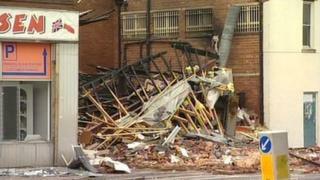 A man and a woman from Birmingham have been found guilty of manslaughter after a 40-year-old Leicester man died following an explosion at a kebab shop. Fiaz Ahmed Ansari's body was found in rubble of Kams King of the Grill 15 hours after the blast in August 2011. Shahbaz Khan and Mehwish Yasin, both 25, told police they had planned to light a small fire in order to make an insurance claim. The pair were sentenced to eight years each in jail at Leicester Crown Court. The court heard Khan had acted as a look-out and had no financial interest in the business. Khan had told the court he did not think anyone would be killed and said the loss of his friend Mr Ansari was devastating. Yasin said she had driven Khan and Mr Ansari to the kebab shop and she also thought the plan was to start a small fire. The court also heard from a forensics expert who said up to 17 litres of petrol could have been used to start the fire. Prosecutor Adrienne Lucking told the court Mr Ansari, a father of two, was heavily in debt. In 2006, he borrowed £42,000 but had only managed to pay back a few hundred pounds. A few months before the explosion he told his wife the restaurant was not making any money and he would have to sell the business, the court heard. Mohammed Ansari, the victim's brother, said: "We will miss him every day of our lives. "We are glad that justice has been served and that the people involved have got what they deserve... but the damage has been done," he added.